Everything was in place for the start, at Great Yarmouth, of the 4th Tour of Britain bike race. And this is how the race preview set the scene on that day over 50 years ago. In the spirit of British sportsmanship the three continental teams were given the first three places on the start sheet. 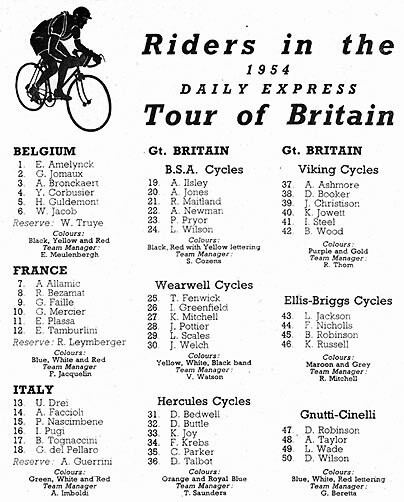 Even though Gordon Thomas and Les Scales had been the first and second place winners in the 1953 Tour. Only 12 teams of 4 to 6 riders were down to start. Respected by British riders last year, small and fair-haired Henri Guldemont makes a welcome return visit, and brings with him a strong team of stage riders. Guldemont, 23, was highest-placed foreigner in last year's Tour. This season to date he has achieved 9th place in the Tour of Calvados, 2nd in the Circuit Disonnais, and 5th in the Grand Prix de Rheims. In the same team is Etienne Amelynck, who, although only 19, has risen high into the ranks of stardom in his country and was placed third in the Lauven-Ghent race two weeks ago and 1st in this year's Tour de Tunisie. In 1953, Arthur Bronckaert, 22, was 1st in the Omninm de la Route and provincial champion of Hainaut. Yvan Corbusier, 22, was 5th in the Circuit Disonnais this year. Willy Jacob, 23, won both the Meulebeke-Bruges race and the Tour de Hesbaye in 1953, this year was 1st in the Grand Prix de Dunkerque. Georges Jomaux has just finished his military service and is a newcomer to the Independent ranks; he is a nephew of the professional Leon Jomaux. Since his appearance in the Tour last year Eugene Tamburlini has gathered experience and knowledge which puts him among the leading Independents in France. He was first in the recent four-day Tour of Champaigne. 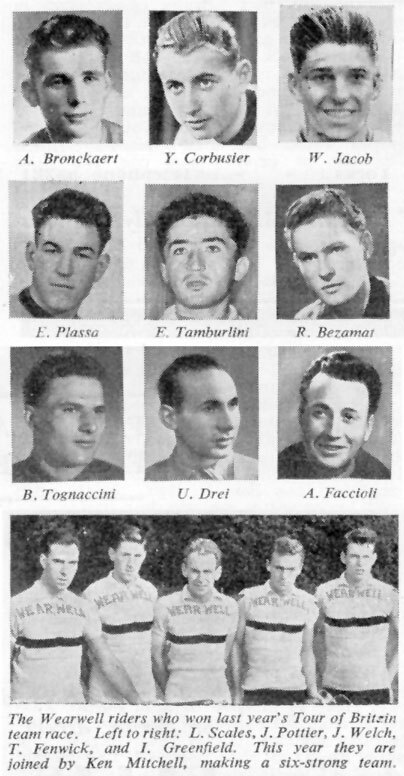 Disappointed last year, Gaby Faille gets his big chance this time, for the 1953 first non-travelling reserve has been picked to represent his country. Roland Bezamat displayed his climbing powers when he raced in the 1952 Isle of Man 1 13-miles International. Good all-round riders are Germain Mercier, Alphonse Allamic and Erio Plassa, all have been selected for their ability and reliability in long stage races. The victorious Wearwell team of last year remains intact, and have had their strength increased by the addition of 23-years-old Ken Mitchell, last year's national amateur pursuit champion, who turned professional road racing six months ago. Les Scales, 24, the company's London sales representative, has a fine record in road racing. He has been second in the past two successive Tours Ian Greenfield, the dour 22-years-old Edinburgh-born rider, third and leading amateur in the 1951 Tour, John Pottier, 23, Birmingham, the first British rider to take the Yellow Jersey from foreign opposition in 1953, John Welch, 26, always an aggressive rider. and Trev Fenwick, 23, of Manchester, possessor of a steady and consistent road-racing record, complete the team. B.S.A. 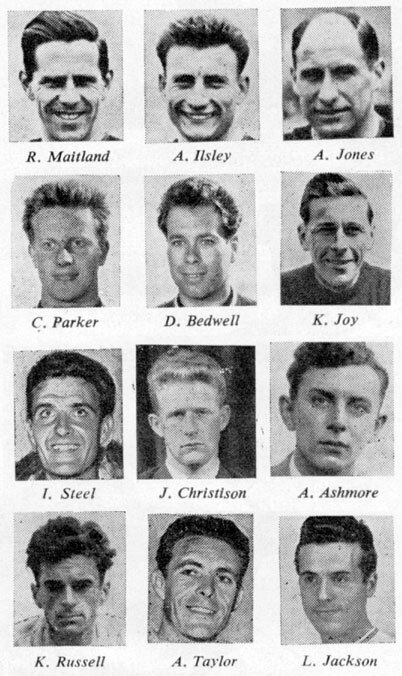 's team, nicknamed the ' Red Devils ' —and not without good reason—won the 1952 Tour of Britain team race, and gave the 1953 Tour the individual winner, Gordon Thomas, and took second team-prize. Two new members are Pete Pryor, 24, and Les Wilson 28, a trackman turned road-rider who scored a fine victory in the two-day Bournemouth Olympic R.C. road race last month. Bob Maitland, 30, the most experienced rider in the field, again captains the team, and has a long and impressive list of successes, including being a former amateur N.C.U. national champion and B.L.R.C. Independent titleholder in 1953, both at home and abroad. A. (Stan) Jones, 'Daddy' of the team, 31, Alf Newman, another former amateur N.C.U. national champion, and Arthur Ilsley, 24, are excellent team riders and strong individualists. Each member has made a distinct impact in cycle racing affairs. For sprinting and climbing hills there is no one in Britain to touch the 1953 Tour's 'King of the Mountains', Dave Bedwell, 26, of Romford. Fair-haired ex-insurance collector Clive Parker, 25, winner of the Dover-London and Tour of the Pennines, has, like his team-mates, achieved a fine reputation through undoubted ability. Dennis Talbot and Derek Battle, both 24, are team-workers to the last and capable wheelmen. Austrian-born Fred Krebs, 22, Cambridge, at present in the R.A.F., the team's latest recruit, has given sterling performances in the Paris-Nice and the Tour of Luxembourg, both Continental 'classics'. Four times holder of Britain's amateur best-all-rounder title, 100-miles professional competition-record holder, Ken Joy, the 6 ft. 3 in. ex-Chatham dockyard painter, is probably the fastest pedaller in the field. From the beginning of road racing in Britain, Viking Cycles has supplied some famous names; one is former B.L.R.C. Independent champion Ian Steel, whose name will always be synonymous with the First Tour of Britain, which he won. This 25-years-old, six-foot, Glasgow-born rider has proved himself since, and is the only rider from Great Britain ever to have won a multi-stage road race abroad (Warsaw-Berlin-Prague, 1952). Bev Wood, 24, scored a third in the 1952 Tour of Mexico. Alan Ashmore, 23, Birmingham, and Bradford-born Ken Jowett, 23, are both reliable team-men. 'Babe' of the team, and of all the Englishmen riding, is 19-year-old Doug Booker from Sale Moor, Cheshire, current Independent Hill Climb champion. Sixth member is Scotsman Joe Christison who, like Steel in 1951, was 'signed' only a few days before the Tour. 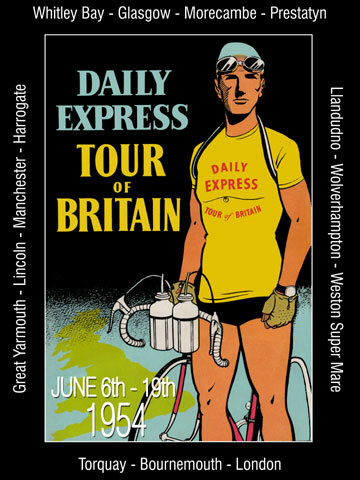 He took part in the 1952 Tour. Ellis-Briggs gave the Tour its 1952 winner —24-years-old and quietly spoken Ken Russell. He defied experts and took the laurels single-handed. Last year E-B enrolled the help of two other riders and one of them, ex-amateur international Brian Robinson, 23, took fourth place after holding the Yellow Jersey for three stages. Both Russell and Robinson, who gained high placings in the recent Tour of the Pennines, will be supported by Len Jackson, 28, of Oldham, who competed in the Wembley Six-Day track cycle race in 1952 and has ridden in over 100 events in Belgium where he has been living since turning professional two years ago, and Fred Nicholls, 25, an ex-miner and former boxer. Oldest member of the four-man team is AlexTaylor, born in Belgium 28 years ago, but who has lived in Britain for most of his life. Taylor, 1947 N.C.U. amateur national massed-start champion, rode for Gnutti in the first Tour and gained second place. Les Wade, 23, a Londoner, has raced with distinction in the past and is making a 'come-back' after two years' absence. Another London man, Dave Robinson, youngest member of the team at 22, has ridden in three Tours and was placed first amateur in 1952. Diminutive Don Wilson, 27-years old Hull brush salesman, has a genial personality and a never-say-die attitude to cycle racing. During the 1951, on the fifth stage, a nasty accident laid him out, but he refused to give up and raced on to the end (another seven stages).